In the final decades of the fifteenth century, the European musical world was shaken to its foundations by the onset of a veritable culture war. At a time when composers like Obrecht, Isaac, and Josquin were bringing the craft of composition to new heights of artistic excellence, critics began to insist that art polyphony was useless, wasteful, immoral, decadent, and effeminizing. They campaigned aggressively to popularize those criticisms, challenging old certainties about music, and threatening its position in contemporary church and society. Their most effective slogans became critical commonplaces, ideas that left their mark in the writings of figures as diverse as Leonardo, Erasmus, Savonarola, Castiglione, and others. Yet defenders of polyphony struck back with a vicious counter-offensive, and for several decades music would remain a topic of bitter controversy. When the crisis had finally passed, in the 1530s, nothing would ever be the same again. 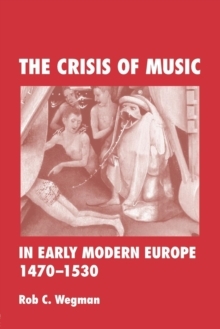 Now in paperback, The Crisis of Music in Early Modern Europe tells the story of this cultural upheaval, drawing on a wide range of little-known texts and documents, and weaving them together in a narrative that takes the reader on an eventful musical journey through early-modern Europe.